We are so excited to announce our MOM (Motivating Mom of the Month) for December! 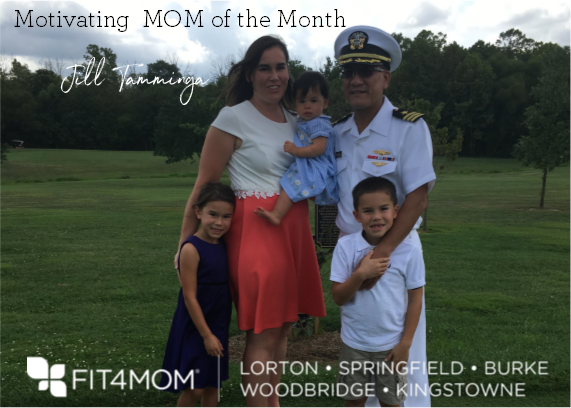 Each month we take a moment to honor one of our local FIT4MOM LSBWK NoVa Moms for her efforts to lead a healthy lifestyle and for her dedication to the program. This month we honor Jill Tamminga from our Burke village! My husband is Pete and we have Max who is 8, Tess who is 6, and Josephine who is 17 months. My Dad was in the Navy when I was growing up, so I lived in many different places. My parents have retired in Southern Maryland, so that is now home. My first Fit4Mom class was back in June 2012 out in California. I actually remember the day before my first class more than the actual class. We had just moved to CA and it was my husband’s first day of work. I put 2-yr-old Max and 6-month-old Tess in the double stroller and walked across the street to the park. While there, I saw the class. I specifically remembered seeing one mom’s bright orange shoes. We ended up at the swings together and I’m so glad I asked the question! The next day was my first class and I was hooked! I went to three classes a week for the next two years, did a couple sessions of Body Back, and eventually became an instructor. I was so glad to find this Fit4Mom when we moved here in May 2018! I’m a Burke girl! I try to get to as many classes at Abiding Presence as I can and go to Springfield Town Center occasionally as well. My career was a Naval Flight Officer in the US Navy. An NFO is like Goose, expect my plane was the E-2C Hawkeye (not the much cooler F-14 Tomcat). It’s the Command and Control aircraft for the Carrier Air Group - all the planes that fly off aircraft carriers. I stayed in for 11 years before deciding that being home with Max was far more important. Then I was a Defense Contractor, a Stroller Strides instructor, and a Sales Rep for my brother’s company over the next 6 years (not at the same time!). Now, I am a stay at home mom! Get a pedicure while reading outdated social magazines, go shopping for me, and eat sushi while reading a good book. Two big things: 1. Things are not necessarily on the timeline I think they should be on and that’s OK! It will happen eventually. 2. It’s OK to let go sometimes. The kitchen can wait! At the acceptance interview for Max’s daycare when he was 10 weeks old, his diaper leaked all over my shirt just before I went in to meet with the director. Tess’ potty training did not go very well and anytime I left her with someone else, she pooped her pants! I left the basement door open here in this house and 11-month-old Jo tumbled down the 10 (thankfully carpeted) stairs. Yes, she was fine, but I did call the doctor to make sure. Have fun and give yourself a break - it’s not going to be perfect all the time. Of course, the workouts are amazing, but it is all about the village! Knowing there are moms that I trust in the same situations that I can complain to, commiserate with, and get advice from is such a relief! I would tell another mom that the workouts are bonus - it’s the other moms that make it amazing.